Ahh back to school. I have so many friends rejoicing in the break they now get. No kids at home for 8 hours a day? Such freedom! Then there is me. Me and my 3 year old. She attends a half day preschool program a couple mornings a week but that hasn't started yet so we have all day every day "just us." Don't get me wrong...I fully enjoy this quality time with my 3 year old. Quality one on one time with any of my children is rare but especially with the third one! However, it's often tricky to plan our days when we are down to "just one" at home. When you have multiple kids under your roof all day during the summer you get into a set routine of how to juggle all those balls at once. Now that school is back in? How can you productively spend your day with a little one still under foot? Having a set routine is so beneficial at every stage in life. From sleep training an infant, to surviving home life with a toddler. There are endless benefits to having a consistent schedule to your day. Figure out what items you want to accomplish. Sit down and write out the "unchangeables" in your day (dropping older kids off at school, what time they get off the bus, any after school activities, etc). Also write out the schedule your "at home" child is used to (meal times, nap times, etc). Fill in all the areas and adjust where needed in order to have your set routine for each day. When you have a routine, it's important to stick with it. I aim for at least 3 days of the work-week sticking to that set routine. 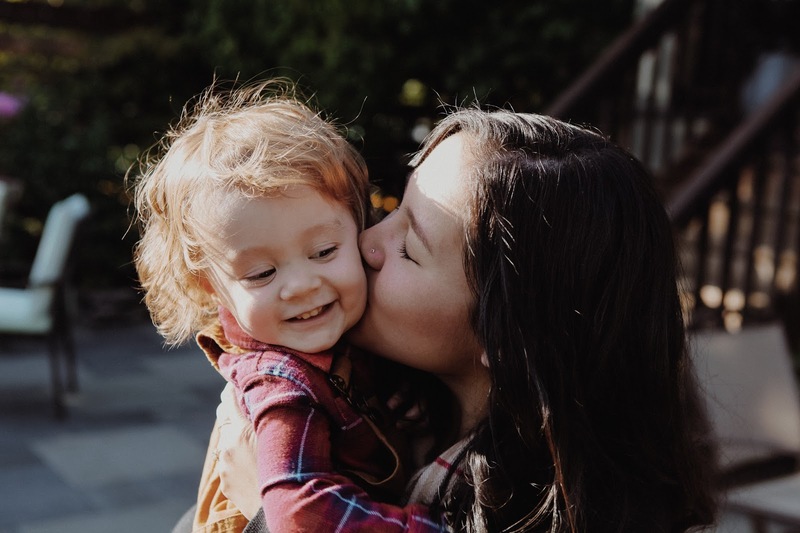 Some kids need more structure (a high sleep needs child may not be as flexible with nap times as a low sleep needs one), some are more naturally flexible. Know your child, know yourself. If you have a work-from-home job (like blogging) then know when you have to have time to get things done for that too! You need consistency and structure just as much as your child. Naps are crucial for that much needed "mommy break." They are also still very beneficial for toddlers (and even preschoolers!). When mapping out your daily routine, be sure to have that beloved nap time on your agenda. Even if your child doesn't always sleep the whole time, they can still rest in their beds and allow both of you a break! Mornings are a perfect chance to get outside and PLAY. It helps toddlers burn off energy and helps you both get some sunshine! We live in South Georgia so the earlier the better in order to avoid the heat. My child still does great in a stroller so we often take a morning walk after dropping off the big kids at school. I like to chunk my time so I can maximize my ability to get the most done. I found that by putting independent playtime with movie time I'm able to have a solid 90 min of "me time" each morning. 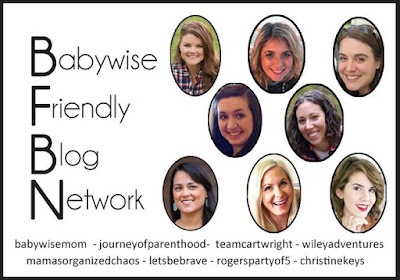 If you haven't already been doing independent playtime with your child, it's not too late! 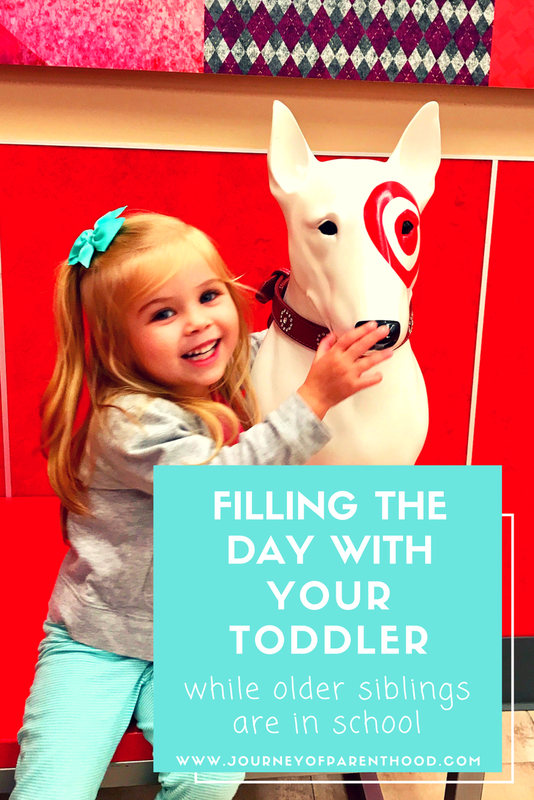 Here's a post about getting started :) I like to do my child's independent playtime around 10:00 in the morning. We drop the big kids off and are back home around 8:30 so it gives us that hour and a half to do some outside time or other time together. Then she will go into her pack and play and play for 45 min of independent playtime. I find that movie time works wonderfully for a reward after independent playtime is over. Usually before she starts independent time she'll pick the movie she's going to watch afterwards. Movie time is usually around 30 min to an hour depending on the day and what we have going on. 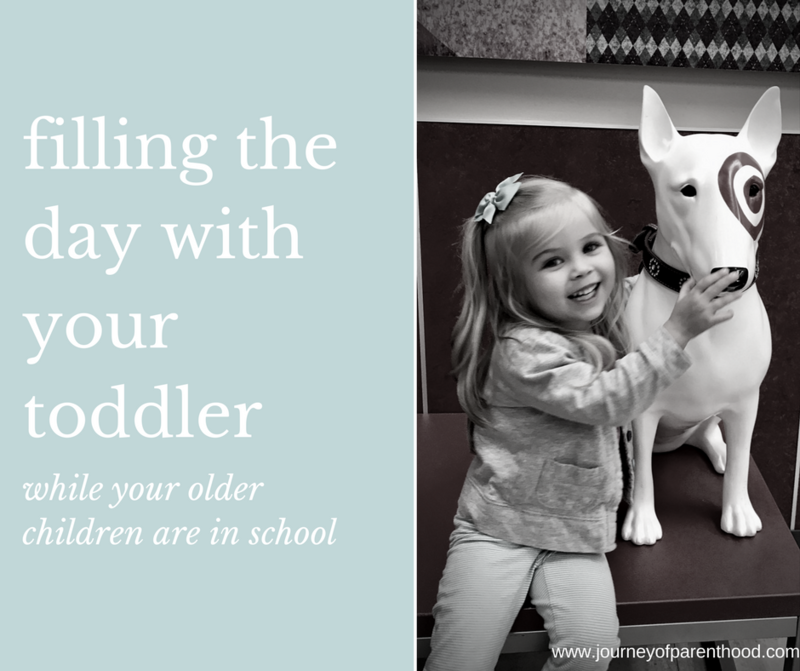 Going and doing with ONE child is SO much easier than with several! It's so fun to take my 3 year old places as all the "aw she's so cute" comments are pretty addicting ;) It's also a chance to teach and train on public behavior. I read somewhere to limit the amount of errands you run to the age of your child. So if you have a one year old...only go to one store. Two years old visit two stores...three years old three stores etc. Typically keeping the errand short results in a better experience for both mama and child! Having children who are a variety of ages makes planning activities where everyone can be engaged and have fun difficult. I have an 8 year old, 5 year old and 3 year old. Stuff the 8 year old would enjoy is often way over the 3 year old's head and stuff the 3 year old would enjoy is often "boring" for the 8 year old. While the older kids are in school it's a great chance to do activities geared towards that younger age. Visit a zoo, a pet store, a playground, or we even enjoy our local YMCA playtime! One on one time is also a wonderful opportunity to work on learning. Again, with lots of kids at home it's hard to take the time to point out colors and shapes. To sit and count or sort items. Having that chunk of solo time with your younger child is an opportunity to help prepare them for when school comes. It's great to have them sit at the table with a puzzle or some other learning activity (even just coloring pages!). I like to do this during lunch meal prep time so I am right there in the kitchen with the child and am able to offer help, ask guiding questions, and it's a great transition into lunch time! Emily is married to Zach and has 3 kids: Kye, Britt, and Tess. She loves Jesus, loves to travel, is super savvy, a Babywise guru, and loves Disney maybe even more than I do. 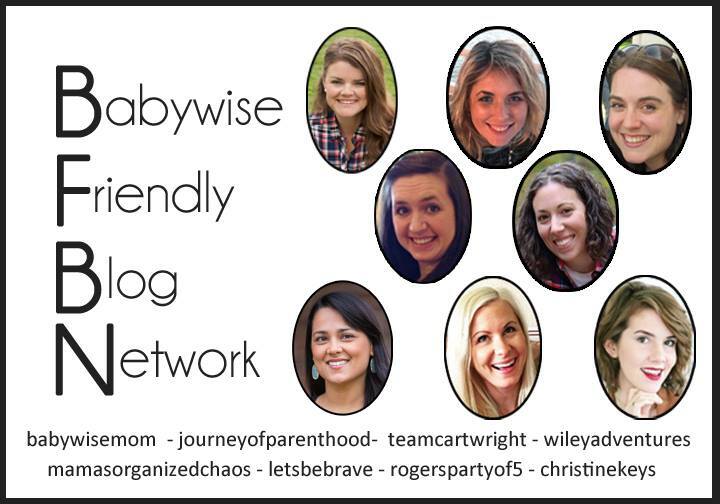 She blogs at www.journeyofparenthood.com.